This is a go-to cigar for everyday. Flavorful smoke at an unbelievable price. Good daily cigar. I believe the natural is a tad better than the maduro in this brand. Lots of flavor. These are my choice for an economical every day smoke. Would perfer these would come in the regular shape rather than the torpedo. My husband smokes Drew Estate Bombero and really likes them. We were looking for something less expensive and tried a bundle of these. He found they fell apart easier and he did not really care for them. Just ordered 2 sets of Drew Estate again. Really good if you're on a budget, and frankly, even if you're not. You will not be disappointed. I've enjoyed Oba Oba for several years and it is a very good choice considErin get price. The fact it frequently sells out speaks for itself. My only complaint is that they are backordered quite frequently. 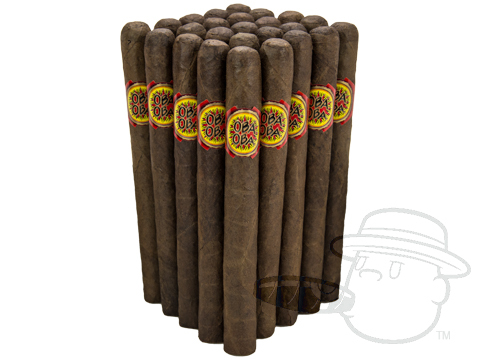 Oba Oba Churchill Maduro - By Perdomo is rated 3.9 out of 5 based on 23 customer ratings.